By Keith Cowing on September 30, 2004 3:02 PM. "In early August everyone left our base camp on Devon Island in the high Arctic. However the Arthur Clarke Mars Greenhouse has been running autonomously since then. In early September we began experiencing technical difficulties with our communications link to the greenhouse. For several weeks a team of dedicated engineers worked the problem. After many long hours, communication with the greenhouse was restored." By Keith Cowing on September 29, 2004 2:48 PM. A memorial service for Tony Schoenfelder will be held this Saturday, October 2, 2004, at 11 AM at the Colonial Funeral Home in Leesburg, Virginia. Continue reading Tony Schoenfelder Funeral Details. By Keith Cowing on September 28, 2004 2:07 PM. "Technical problems have prompted a further delay to the blast-off of a Russian spacecraft to the International Space Station, space officials said on Tuesday." "He added the new launch date had not yet been set and did not elaborate on the technical hitch." By Keith Cowing on September 27, 2004 4:33 PM. "Today, Sir Richard Branson announced that Virgin Group has entered into an agreement to license the technology to develop the worlds first privately funded spaceships dedicated to carrying commercial passengers on space flights." By Keith Cowing on September 27, 2004 2:13 AM. "The Bigelow Aerospace project to privately develop inflatable Earth-orbit space modules is beginning to integrate diverse U.S. and European technologies into subscale and full-scale inflatable test modules and subsystems at the company's heavily guarded facilities here. Company founder and millionaire Robert T. Bigelow told Aviation Week & Space Technology that he will announce as early as this week a new $50-million space launch contest called America's Space Prize." By Keith Cowing on September 26, 2004 9:50 AM. By Keith Cowing on September 26, 2004 9:00 AM. Continue reading The Budget Game Continues. By Keith Cowing on September 26, 2004 8:51 AM. "Gwendolyn Sykes, NASA's chief financial officer, woke up at 7 a.m. Sept. 23 to hear the news of a tropical storm approaching Kennedy Space Center in Florida, where employees were trying to meet their three-day deadline for closing the fiscal year's financial books. But rather than fretting about the weather, staffers simply moved to Marshall Space Flight Center in Alabama and carried on with their work, Sykes said." By Keith Cowing on September 25, 2004 9:09 PM. "During a special symposium hosted by Administrator Sean O'Keefe, NASA examines the similarities between space exploration and other terrestrial expeditions with the help of some of the best known explorers in the world, including mountain climbers, deep sea explorers, scientists and science fiction writers. The discussions also will include NASA astronauts, other notable aeronautics and deep space explorers. The symposium will be carried live Sept. 27-28 on NASA TV and webcast on www.nasa.gov from the Naval Postgraduate School in Monterey, Calif."
"NASA may have discovered its best spokesman and chief advocate Wednesday in the form of Mike Foale, commander of Expedition 8." By Keith Cowing on September 24, 2004 11:56 AM. "Shortly after C&C3 took over as Prime MDM, fire and smoke alarms were set off from the FGB, annunciated (and reacted to) both in the Russian and U.S. segments. The crew reported no smoke or smell in the cabin and felt comfortable enough to return to bed. It is unclear at this time how the FGB alarm was triggered and whether it was related to the C&C MDM transitions. Currently under investigation." By Keith Cowing on September 23, 2004 9:11 AM. "After three decades working as a senior correspondent for NBC news, award-winning journalist Fred Francis has joined NASA as a special consultant. Francis will assist the agency in developing communication tools and strategies as the agency moves closer to Return to Flight and the launch of the Space Shuttle Discovery for STS-114." "Dr. Neal M. Burns, who since July has served as a special assistant to the Administrator and acting Chief of Strategic Communications, has decided to return full time to his family and his academic career at the University of Texas at Austin." By Keith Cowing on September 22, 2004 6:22 PM. "The U.S. Senate Committee on Commerce, Science and Transportation today passed the NASA Authorization Act of 2004. The legislation includes an amendment authored by Sen. Kay Bailey Hutchison (R-TX) that requires the National Aeronautics and Space Administration (NASA) to prepare a plan for operating the Space Shuttle until the Crew Exploration Vehicle (CEV) is ready for flight." By Keith Cowing on September 21, 2004 10:27 PM. "With approximately 2000 employees being affected by the realignment, the official personnel actions assigning employees to their new organizations will be processed in phases over a two month period beginning the end of October." Hints of Life's Precursors Among the Stars? By Keith Cowing on September 20, 2004 4:33 PM. "Astronomers using the NSF's giant Robert C. Byrd Green Bank Telescope have discovered a frigid reservoir of simple sugar molecules in a cloud of gas and dust 26,000 light-years away, near the center of our Milky Way Galaxy. The discovery suggests how the molecular building blocks necessary for the creation of life could first form in interstellar space." Hints of life on Present Day Mars? By Keith Cowing on September 20, 2004 4:18 PM. 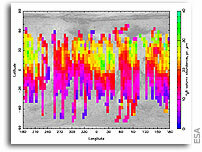 "Recent analyses of ESA's Mars Express data reveal that concentrations of water vapour and methane in the atmosphere of Mars significantly overlap. This result, from data obtained by the Planetary Fourier Spectrometer (PFS), gives a boost to understanding of geological and atmospheric processes on Mars, and provides important new hints to evaluate the hypothesis of present life on the Red Planet." By Keith Cowing on September 20, 2004 4:10 PM. "... space shuttles still remain grounded; and no one knows when their flights will be resumed. The United States is to commission a new space-transport system at least eight years from now. Consequently, NASA has no alternative but to reserve seats aboard Russian spacecraft." Continue reading No New launch date for Soyuz 9S - Yet. By Keith Cowing on September 20, 2004 11:52 AM. "A piece of Space Shuttle Columbia, now identified as being Window No. 8 was recently found in Angelina County, Texas.Window No. 8 is one of two windows located on the top of the shuttle, directly over the crew. Last week NASA and United Space Alliance personnel - and technichians from Weston Pyrotechnic - reviewed what pyrotechnic devices may still be intact." By Keith Cowing on September 19, 2004 8:56 PM. "After 10 years in the making and about three years since ground was broken, MU dedicated the $60 million Life Sciences Center yesterday in a festive afternoon that included live music, food, drinks and tours of the facility. The leader of America's space agency was there, and there were friendly exchanges between Democratic and Republican politicians." "North Stonington -- "I never excelled at anything," NASA Administrator Sean O'Keefe said last Friday. "I am living testimonial and proof that it's better to be lucky than good." The humble O'Keefe was describing his journey from graduate of Wheeler High School in North Stonington to top dog at NASA." "DEFENSE. Rumsfeld, scarred by the Iraq prisoner abuse scandal, is cagey about his future. Bush has stood by him, but Rumsfeld has many detractors in Congress and the military. While spry at 72, his age could become a factor. If Rumsfeld leaves, the job could go to Rice, NASA chief Sean O'Keefe, House Homeland Security Committee Chairman Christopher Cox of California or former Sen. Sam Nunn, a Georgia Democrat who once headed the Armed Services Committee." By Keith Cowing on September 18, 2004 9:28 PM. "Processing activities associated with orbiter Thermal Protection System (TPS) tiles are scheduled to begin Monday. Following the move of the second floor TPS blanket area to a hangar at the Shuttle Landing Facility (offered by the Florida Space Authority), TPS blanket production could begin as early as Sept. 27." "Engineers are making progress on techniques that will enable astronauts to repair small cracks and holes up to four inches in diameter. But the agency says it will be unable to fix larger holes by the time shuttles return to flight." "Hurricanes Charley, Frances and Ivan have cost NASA at least a week's worth of work and upset its tight schedule for resuming shuttle flights, throwing into doubt the space agency's plans to launch Discovery in early spring." By Keith Cowing on September 18, 2004 1:00 AM. "The Defense Advanced Research Projects Agency (DARPA) and the U.S. Air Force have awarded funding to four teams for the second phase of the Falcon Small Launch Vehicle (SLV) program. The goal of the Falcon SLV program is to develop and demonstrate an affordable and responsive space lift capability." By Keith Cowing on September 18, 2004 12:57 AM. "1. Extension of the due date for offerors impacted by hurricane activity as follows: Response Date: Electronic Proposals due September 29, 2004 4:30 P.M. EDT." By Keith Cowing on September 17, 2004 11:08 AM. "Now another president, George W. Bush, says it's time to unleash America's technological know-how for further exploration. But note that the popular idea that Bush has buckled America up for a trip to Mars isn't quite what he said. As noted in "New Moon Rising" by Frank Sietzen Jr. and Keith L. Cowing (Apogee Books), which will be reviewed in Sunday's Times, Bush's message focused on a return to the heavens, not a specific mission, not even about going to Mars at all. People in Huntsville may have a sharper focus about the need to move forward than elsewhere." By Keith Cowing on September 17, 2004 10:26 AM. GAO was asked by the Senate Government Affairs Committee to look at NASA's financial management. We are looking for reports of allegations of fraud, waste, and abuse of NASA's financial mismanagement of funds. Concerned about NASA's serious financial management problems recently reported by the Government Accountability Office (GAO) and the NASA IG, the Senate Government Affairs Committee Chairman, Senator Susan Collins, has requested the GAO perform one or a series of audits and investigations to test the design and effectiveness of NASA's internal controls over disbursements, including its credit card programs. The Committee Chairman has expressed concerns about wether NASA has an effective system of internal controls to prevent fraud, waste, and abuse of taxpayer resources. Specific concerns about fraud, waste, and abuse at NASA can be reported confidentially to GAO. The purpose of the Government Accountability Office's FraudNET is to facilitate the reporting of allegations of fraud, waste, abuse, or mismanagement of federal funds. By Keith Cowing on September 17, 2004 1:23 AM. "A University of California scientist working at Los Alamos National Laboratory and researchers from Northrop Grumman Space Technology have developed a novel method for generating electrical power for deep-space travel using sound waves. The traveling-wave thermoacoustic electric generator has the potential to power space probes to the furthest reaches of the Universe." By Keith Cowing on September 16, 2004 12:38 PM. "Concerned about NASA's serious financial management problems recently reported by the Government Accountability Office (GAO) and the NASA IG, the Senate Government Affairs Committee Chairman, Senator Susan Collins, has requested the GAO perform one or a series of audits and investigations to test the design and effectiveness of NASA's internal controls over disbursements, including its credit card programs. The Committee Chairman has expressed concerns about whether NASA has an effective system of internal controls to prevent fraud, waste, and abuse of taxpayer resources." Continue reading GAO Seeks Input on Possible Financial Management Problems at NASA. By Keith Cowing on September 16, 2004 11:32 AM. "A large piece of space shuttle Columbia debris found recently is a part of the crew compartment, possibly including the escape hatch, a NASA official said Wednesday. The six-foot-long piece containing a hinged window was found in Newton County by Jason Sebesta, a wildlife biologist with Temple-Inland Inc."
By Keith Cowing on September 16, 2004 1:22 AM. "Please clarify your position on privatizing Ames. If you still support conversion of ARC to a private entity, then please say so and support this opinion with clear and compelling facts. If you have changed your mind since June, and are opposed to it or have become noncommittal, then please say so and explain why you previously thought it was wise to put ARC at higher risk for privatization by your proposal to Mr. O'Keefe. Either way, your Civil Servant employees, who stand to lose their job security and many of their benefits, deserve a forthright explanation." By Keith Cowing on September 15, 2004 9:54 PM. "This RFI, issued by NASA's Office of Space Operations, is to obtain information regarding capabilities and market interest from existing and emerging domestic commercial space transportation providers. NASA will use this information to shape agency acquisition strategy for space transportation services." By Keith Cowing on September 15, 2004 9:35 PM. The respected science journal Nature posed 15 questions to President George W. Bush and Democratic presidential nominee John Kerry on key science issues. 7) NATURE: Do you think the United States should send astronauts to the moon or Mars in the next 10 to 15 years? If so, why send humans instead of robots? If not, what is the purpose of the space shuttle and space station? Continue reading Bush and Kerry on Science. By Keith Cowing on September 15, 2004 12:14 PM. "The launch of a Russian rocket scheduled to blast off to the International Space Station next month has been postponed because of problems with the docking system, Russia's space agency said on Wednesday." "The explosion of a small separation bolt aboard the Soyuz spaceship now being prepared for a trip to the international space station may delay that launch for five or 10 days, Russian space officials have told journalists in Moscow. But so far, Russia has not officially informed its American partners of any possible delay." By Keith Cowing on September 15, 2004 9:50 AM. "WhiteKnight, the unique aircraft developed by Mojave's Scaled Composites to launch the company's SpaceShipOne space craft, will have a new job early next year,the DesertNews learned this week." ... "Braukus had no further information on the decision to have the Scaled aircraft launch the X-37, saying that management of the project has been taken over by an agency he said he could not identify." Editor's note: When asked by NASA Watch today (13 Sep) if he could elaborate on who the new sponsor of X-37 research is, NASA spokesman Mike Braukus said: "the new government partner is classified. We will acknowledge the government partner when the partner gives us permission." Editor's note: In an additional email Tuesday morning, Mike Braukus commented: "I read an article this morning from Bill Deaver of the Desert News claiming that I said that Rutan's White Knight will be used -- if you plan to use that article it's inaccurate. I told Mr. Deaver that I didn't know what aircraft Scaled Composites planned to use to drop the X-37 and that he should contact them for that information." Editor's note:Mike Braukus subsequently confirmed to NASA Watch that the X-37 program had been transfered to DARPA. By Keith Cowing on September 15, 2004 9:02 AM. Editor's note: President Bush has now submitted an additional request to Congress for additional emergency FY 2004 supplemental appropriations in response to damage caused by the series of hurricanes which have struck the U.S. NASA is one of the agencies covered in this request: "For an additional amount for "Space Flight Capabilities," to repair facilities damaged and take other emergency measures due to the effects of hurricanes, $126,000,000, to remain available until expended: Provided, That Congress designates this amount as an emergency requirement for this specific purpose." "I will introduce a supplemental bill today that closely mirrors the President's request. I plan to move this package quickly and cleanly through the Congress. The sooner we get it on the President's desk, the sooner the aid can flow to our ailing communities." "NASA: Space flight capabilities 126.0"
By Keith Cowing on September 15, 2004 1:48 AM. "Preparations are under way to secure important space flight hardware. NASA's Stennis Space Center (SSC), Miss., and the Michoud Assembly Facility, New Orleans, are getting ready to ride out the storm. Other NASA installations, from Johnson Space Center, Houston, to Kennedy Space Center, Fla., are keeping a wary eye on Ivan's track." "MAXIMUM SUSTAINED WINDS ARE NEAR 140 MPH...WITH HIGHER GUSTS. IVAN REMAINS AN EXTREMELY DANGEROUS CATEGORY FOUR HURRICANE ON THE SAFFIR-SIMPSON HURRICANE SCALE. FLUCTUATIONS IN INTENSITY ARE COMMON IN MAJOR HURRICANES AND ARE POSSIBLE OVER THE NEXT 24 HOURS. IVAN IS EXPECTED TO MAKE LANDFALL AS A MAJOR HURRICANE...AT LEAST CATEGORY THREE." By Keith Cowing on September 13, 2004 5:26 PM. "Update on Elektron: The Elektron O2 generator is still Off. After the replacement of the gas analyzer for hydrogen (H2) in the O2 line by Padalka last Friday (9/10), the machine ran for about an hour and then shut down again. Moscow subsequently diagnosed the culprit to be a pressure increase in the hydrogen (H2) line due to cross-sectional constriction caused by deposits of KOH (potassium hydroxide) crystals." Continue reading Oxygen Supplies Tight on ISS. By Keith Cowing on September 13, 2004 4:14 PM. Richard H. Jackson former owner of Missile, Space, and Rocket Used Books is selling his personal collection of over 6,000 space related books. Continue reading Monster Space Book Auction. By Keith Cowing on September 13, 2004 10:20 AM. "MAXIMUM SUSTAINED WINDS ARE NEAR 160 MPH...260 KM/HR...WITH HIGHER GUSTS. SOME FLUCTUATIONS IN STRENGTH ARE EXPECTED DURING THE NEXT 24 HOURS." By Keith Cowing on September 12, 2004 10:42 PM. Responses are due on 12 October 2004. NASA GSFC: "We plan to invite formal presentations and discussions at GSFC of the more compelling responses within 45 days of the RFI issuance." By Keith Cowing on September 10, 2004 4:12 PM. By Keith Cowing on September 10, 2004 4:00 PM. "The [House Appropriations] Committee has recommended a total program level of $15,149,369,000 in fiscal year 2005, which is a decrease of $1,094,631,000 from the budget request and a decrease of $228,663,000 when compared to the fiscal year 2004 enacted appropriation." By Keith Cowing on September 10, 2004 12:13 PM. Continue reading 11 September 2001: Bad news from Earth. By Keith Cowing on September 10, 2004 12:00 PM. 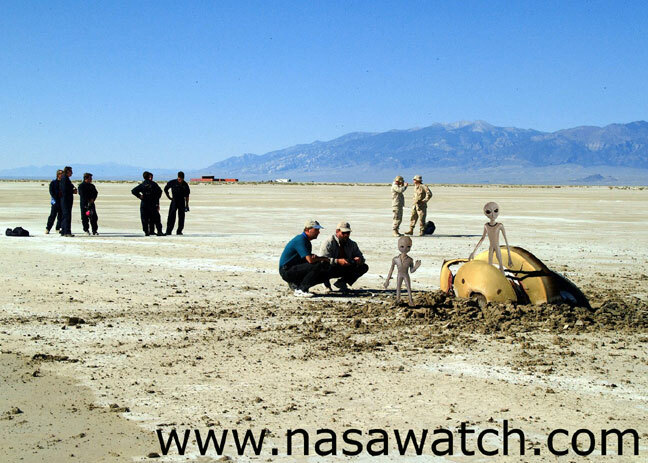 Editor's note: According to an update given by Al Diaz, AA for Science, on NASA TV this morning, the desert floor was "a little more resilient" than NASA had thought - and there is some hope that much of the scientific data can be recovered. 2 of 3 collector systems were recovered either intact or broken - but still useful for science. Only the foils on the outside of the sample canister were substantially damaged. As such, according to Diaz "there will be some scientific return". More details will be discussed at a press conference which has been rescheduled for 1:00 pm EDT today. Continue reading Genesis Crashes on Earth - but still returns Science. By Keith Cowing on September 10, 2004 12:10 AM. "Today, members of a key Senate Appropriations subcommittee are poised to slash NASA's budget and undermine President Bush's historic vision for space exploration. Such a move could have devastating consequences for the future of America's technology workforce and squander a tremendous opportunity to create new, good-paying jobs in high-tech industries." "NASA, its budget already stretched by underfunding and last year's loss of the shuttle Columbia, also will need additional dollars. The Kennedy Space Center suffered its worst damage ever from Frances. The destruction could set back plans to resume shuttle flights in the spring. The sooner Congress comes up with a new round of disaster relief that meets these and other needs, the sooner Florida will recover." "Rep. James Walsh, R-N.Y., chair of the House subcommittee that oversees the National Aeronautics and Space Administration, has agreed to accept a restructuring of the agency's operating plan that frees up $75 million in unspent fiscal year 2004 money. The funds now can be used for the contracts, and other elements of the new space plan announced by President George W. Bush last January." By Keith Cowing on September 8, 2004 5:23 PM. "Data from the Mars Global Surveyor and Mars Odyssey spacecraft now show that the region surrounding the Opportunity rover's landing site probably had a body of water at least 330,000 square kilometers, or 127,000 square miles. That would make the ancient sea larger in surface area than all the Great Lakes combined, or comparable to Europe's Baltic Sea." By Keith Cowing on September 8, 2004 5:10 PM. In an exchange this afternoon between Fox's ever cherubic Neal Cavuto and perennial Democratic commentator, former Dukakis Campaign Manager Susan Estrich, Cavuto noted that Kerry's image was not affected too much "by that Willie Wonka get up". Estrich agreed with Cavutos assessment. Meanwhile, KerrySpace, a new space website focused on developing a space policy for the Kerry campaign, was announced in a posting by a group of Kerry space supporters. According to the developer of the website, KerrySpace.com is also soliciting contributions. "This fund will be used to make purchases that will further our cause, such as postage and stationary to do a letter writing campaign, purchase an ad in Space News or Ad Astra to tell the space community about our group, and other ideas that are described on the website." In addition "donations can be made anonymously by request." Alas, it would seem that this group is somewhat uninformed when it comes to FEC regulations about activities on behalf of a candidate - and what you have to do if you are going to raise and spend money on their behalf and how you need to document all contributors and expenditures. I tried to post something to this effect on their website, but the moderator rejected my post - twice. Continue reading Kerry Space Policy Update. By Keith Cowing on September 8, 2004 10:12 AM. "Full Committee hearing scheduled for Wednesday, September 8, at 10 a.m. in room 253 of the Russell Senate Office Building. Members will hear testimony examining the status of NASAs space shuttle program and NASA's efforts to implement the recommendations of the Columbia Accident Investigation Board. Senator McCain will preside." Editor's note: NASA's Office of Legislative Affairs seems to have been unaware that this hearing was happening. The last time they updated their website of 'upcoming hearings' was 27 July 2004. This hearing is not mentioned - nor is Sean O'Keefe's testimony posted as of 3:00 pm EDT. "NASA (news - web sites) administrator Sean O'Keefe said Wednesday the cost of fixing all the problems with the space shuttle fleet could top $2.2 billion double the estimated price tag given to Congress a year ago." By Keith Cowing on September 7, 2004 8:32 PM. "Assessment of KSC's landmark facility, the Vehicle Assembly Building (VAB), shows about 820 panels were torn off during the storm. Initial review of the VAB's interior indicates no serious damage to equipment, including two Space Shuttle External Tanks. Engineers are continuing their damage assessment. The Thermal Protection System Facility, where Space Shuttle tile and blankets are manufactured, suffered significant damage. Work is under way to recover critical spaceflight material, such as tile molds, from exposed areas." Reader suggestion: "Hey, just a thought... NASA should sell pieces of the VAB damage, like cut up the siding into smaller pieces and sell it. Wouldn't hurt to have some extra $, and let the public own a piece of space history..."
Continue reading Detailed VAB Damage Photos. By Keith Cowing on September 6, 2004 11:00 PM. "NASA Kennedy Space Center Director Jim Kennedy held a teleconference with the news media this afternoon and provided a preliminary picture of the damage Hurricane Frances inflicted upon the space center. The Vehicle Assembly Building (VAB) has the most visible damage. According to Kennedy the damage can be seen on the South and East walls of the VAB. There are some 1,000 panels that have lifted off of the building. There are also areas of insulation and subpanels missing. Each panel is 4x10 feet in size. The Shuttle Tile Facility suffered significant damage. The roof is partially gone and there is extensive water damage inside." By Keith Cowing on September 6, 2004 8:06 PM. "This Congressional Budget Office study assesses the implications that those plans might have for the content and schedule of NASA's future activities as well as the funding that might be needed to execute them. CBO developed estimates of how the costs to carry out NASA's plans for space exploration might differ from its current budget projection and then assessed potential budgetary or programmatic options that might be available to address such cost differences." "NASA is going to have to earn it a dollar at a time and a day at a time," Cowing said. "There are now problems cropping up with (the plan to return the space shuttle to flight in 2005), and now with the hurricane (damage at Kennedy Space Center), the first time you will hear discussions about new money will be about cost overruns. "People are tired of hearing about cost overruns. They turn on cynic filters." NASA's New Venture Capital Fund: "The Mercury Fund"
By Keith Cowing on September 6, 2004 7:42 PM. "This procurement is for the purchase of the legal services and business advice in support of the Agency's effort to create a venture capital fund similar in concept to the Central Intelligence Agency's (CIA) In-Q-Tel. NASA's fund is hereby referred to as "The Mercury Fund". The services provided under this contract will include unique legal, taxation, and operational advisory services. The goal of The Mercury Fund will be to invest in tandem with established private sector venture capital funds to sponsor innovative, multi-use technologies to help NASA achieve its mission and to better position these technologies for future multiple and/or commercial uses." By Keith Cowing on September 5, 2004 11:00 PM. "... current plans call for a survey team to return to KSC around 7:00 AM EDT on Monday, 6 September. The hope is that they can provide an initial damage assessment by noon on Monday. NASA is not expected to make any official announcements until that assessment has been made." Continue reading Hurricane Frances Slaps KSC. By Keith Cowing on September 3, 2004 10:19 PM. "Smoothly and ahead of schedule, Expedition 9 Commander Gennady Padalka and Flight Engineer Mike Fincke completed the fourth and final spacewalk of their six-month mission today. Padalka and Fincke spent five hours, 21 minutes outside the International Space Station (ISS) on maintenance tasks and installing antennas to prepare for the initial arrival of a new European cargo spacecraft next year." Continue reading ISS Crew Completes EVA. By Keith Cowing on September 3, 2004 4:11 PM. "The board that investigated the loss of the remotely operated Helios Prototype aircraft during a test flight last summer released its final report." Should ET write - not phone - home? Or has he already placed a call? By Keith Cowing on September 3, 2004 10:03 AM. "A rash of reports in recent days that SETI@home has discovered a likely signal from an alien civilization are highly exaggerated, says SETI@home Chief Scientist Dan Werthimer of U.C. Berkeley." Continue reading Should ET write - not phone - home? Or has he already placed a call?. More than one way to shove an asteroid? By Keith Cowing on September 3, 2004 12:12 AM. "What I fear there is that, within the community of researchers, there exists a de facto, and perhaps sub-conscious acceptance that the "default" method for future asteroid deflection will be via the use of nuclear explosives. My sense is that, while the current asteroid characterization work is both valuable and unquestionably needed, it comes up short of the detailed surface information needed by the "soft" deflection concepts." By Keith Cowing on September 2, 2004 8:53 PM. "On Sept. 7, 2004, in collaboration with San Jose State University, San Jose, Calif., the Computing, Information and Communications Technology (CICT) program office at NASA Ames Research Center, located in California's Silicon Valley, will offer a free Web-based Advanced Aerospace Technology course to inspire students to pursue careers in math and science. ... The final day to register is Sept. 7, 2004." Editor's note: This press release - with registration information and a deadline of 7 September - was sent out on the afternoon of Thursday, 2 September. The soonest anyone - parent, student, or teacher - might see it is on a news website on Friday, 3 September - the day before the Labor Day weekend holiday (assuming they are not off on a long weekend already). Monday, 6 Sept. is a Federal holiday - and everything is closed. The final registration date, Tuesday 7 Sept is the day most students start school. Again, as was the case on two other press releases NASA ARC issued [see Announcing Events Already Underway]- after the events had already started a week or so ago, I have to ask: why even bother putting this information out at such a late date - information on attendance or registration - when it is virtually impossible for anyone to take advantage of this information? By Keith Cowing on September 1, 2004 6:08 PM. "NASA today awarded the first contracts to conduct preliminary concept studies for human lunar exploration and the development of the crew exploration vehicle. Eleven companies were selected." "NASA's Glenn Research Center (GRC), Cleveland, today awarded an 8(a) cost-plus-award-fee contract valued at approximately $41 million to Mainthia Technologies, Inc., (MTI), Cleveland." John Glenn in space - again? By Keith Cowing on September 1, 2004 12:09 PM. In introducing Sen. John Glenn to the National American Legion Convention today, John Kerry joked "If I am elected President I told John that he can go into space one more time". Kerry then said that Glenn had told him that it would "cost the government less money since he'd get a senior citizen discount." Gee, why Glenn didn't mention that discount the last time he flew? By Keith Cowing on September 1, 2004 11:07 AM. Editor's note: Over the next few days we'll be bringing the new, upgraded NASA Watch online. This task includes making sure that previous information (in some cases dating back to 1996) can still be easily found. As such, please pardon any odd things you see appearing and then disappearing. We will try and limit these changes to the late evening hours. As part of this upgrade we have also launched a new companion website Commercial Space Watch. By Keith Cowing on September 1, 2004 11:05 AM. "On August 31st the last Atlas 2 rocket was launched from Launchpad 36A in Florida (the launchpad is also being retired) and one orbit later its Centaur upper stage overflew Toronto and vented excess reactants into space shortly after nightfall." Image online here.